For the last 10 years, business models for decentralized electrification have been taking a big leap towards forming a scalable, profitable industry. In 2016 alone, the Global Off-Grid Lighting Association (GOGLA - the largest industry association in this field) has reported about 8 million products sold. This equals about 8 million end-users to purchase a solar product and therefore take a step towards more reliable, clean and climate-friendly use of a power source. Most GOGLA members are currently active in sub-Saharan Africa or South-East Asia. When entering a rather financially or politically risky market in these regions, there are a few hints to be considered to make your idea successful. Over the past few years, an increasing number of international companies has accelerated their activities in decentralized solar electrification in developing and emerging markets all over the world, with clusters located particularly in India and East Africa. In these regions, the first challenge of creating trust in a new technology that brings power and light into one’s home has been largely overcome – at least when looking at growth rates and sales in the industry. Nevertheless, this whole sector relies largely on word-of-mouth marketing. There’s no better marketing than friends and family recommending your product to their peers. Trust in quality might be a factor, but many potential end-users need to see the actual impact on daily life first before investing a share of their wallet into these products that come in a vast variety, with high and low prices, good and bad quality. It’s not easy for companies to tackle the barrier that they face with all the copy-cats and low-quality products that are being distributed without any international certification or standard. This is where companies join forces and try to convince multinational organizations and local governments to acknowledge the threat imposed by those products. Agreements on certain terms for import and quality standards that industry players need to adhere to are necessary to protect consumers and the market as a whole. There are various niches in the off-grid solar industry – and as a company, you need to find your way into what’s most attractive to you. The majority of companies start off with smaller products, focusing largely on the very base of the pyramid where donor interest accumulates because end-users in that segment supposedly have rarely any financial resources to spend on lighting. But with a growing market and many new players entering, one can see a shift towards larger products and broader services. With more capacity (i.e. larger panels, batteries that are more powerful) clients can purchase more lights, bigger appliances, long-term service. Ideally, one can see customers shift from smaller products to larger ones during their lifetime. Same as with phones or TVs, once you have the basic version, the desire to have more rises. That’s why an increasing number of companies offer TVs, larger phone chargers, better quality. In order to understand the shifts that users take and the various models that are being offered, actors like the World Bank spend time and resources on developing detailed insights in e.g. their Multi-Tier Framework for Electrification. It helps understand the steps on the energy ladder. Once you’ve established yourself as a company, you most likely start thinking about what to offer next. As described above, product portfolios might grow, diversification comes into play, more desires and needs are being expressed by your customers. At Mobisol, innovation is primarily based on feedback expressed by our clients. Frequent contact and conversations help us understand what’s most attractive. And the most attractive is very often something that helps uplift the customers’ standard of living. Which is where we perceive our impact: at the beginning of the energy ladder, it’s all about lighting. Which is the first necessary step – a family comes together in the evening, phones can be charged, communication is easier, and children can do their homework after dark. After that, there’s more needs to be covered: security lights and alarm systems outside the houses giving the parents a feeling of improved safety, small business men and women wanting to foster their income stream with high-quality productive-use appliances and smart technologies. Pay-as-you-go backs the micro-financing aspect that is largely applying to the larger and newer products in the industry, where even barbershops open in remote areas, with DC-powered haircutters and lights, financed over a few years and paid off via mobile banking. Flexibility and curiosity is key, involve your customers and you will find out easily how to improve their lives whilst growing your business. As mentioned before, productive-use appliances are an easy argument for the solar off-grid industry, helping customers earn incremental income which then facilitates repayment of their products. The power of solar energy has not even begun to be exhausted. 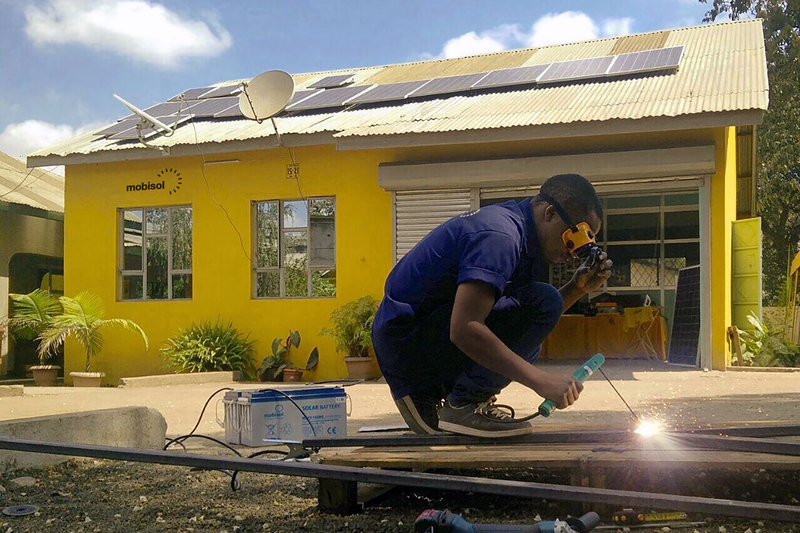 Just recently, solar welding has been tested by Mobisol, combining solar components to an 800W working station. Scaling this idea would not only profit some families, it would build local economies, help utilize the rural youth workforce which is still underemployed in various regions in sub-Saharan Africa. Access to energy facilitates business, and will do so if more off-grid DC appliances are being developed and distributed in an affordable and high-quality manner. Communities will become independent of the central grid extension that they have been waiting for during the past and share knowledge on how to improve local business performance with the right products. Technology and innovation is just now starting to take off. There is so much more to be developed in the decentralized electrification market. Components will soon be produced locally, and spare parts printed in 3D which will promote local jobs and develop entirely new markets. Universities are initiating courses on renewables and policymakers are acknowledging the potential of the sector, fostering off-grid solutions in their regulations. The DC appliance market is growing, with yearly buyer’s guides coming out listing the high-potential products that are expected to revolutionize the way we think about electronic consumer goods. Sub-Saharan Africa has the potential to leapfrog not only fixed lines, conventional bank accounts and grid electrification – it will hopefully overcome climate-negative technologies and pioneer in energy efficient use of products and power consumption, thereby triggering economies of scale and exporting DC technologies and products to other parts of the world one day. For more information about the 2017 class of Technology Pioneers, visit our website.